You like? It's by Stila, whose line of makeup I lurve. This palette had good reviews on Sephora, plus it contains every color under the sun (and then some), so I figured it was a good buy. I hope she likes it! I am thirty-two, Cuban-American, born in Miami. I was raised in Hialeah, where I also went to school. I am the only one in my immediate family to graduate college. Only next time as a teacher. hear you, hear me – we all – you, me talk on this page. Well, like Langston Hughes, I also like to eat, sleep, drink, and be in love. I like to ask questions, learn lots, read, listen, and think about life. Or CDs -- U2, Shakira, or Regina Spektor. the same things other folks like who are other races, other ages. Will my page be colored that I write? in a rainbow of riotous red, spunky orange, joyous yellow, and glittering green. Then wash this page in calming blue, forgetting not the violet. All the colors that make me, you. Me, you, you me –-- we all color this page called life. nor do I often want to mix mine with yours. But we do, that’s true! This is my page for English I.
I think it's such a good idea to do the assignments that you assign your students. 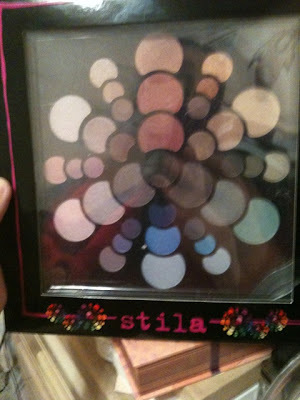 :) And I looooove Stila, too! I've tried several of their products, and sweet Summer sent me a set for Christmas with eyeshadow, moisturizer, and the most incredible lip gloss. I'm such a Sephora addict . . .
what a great gift for your mama! i feel like a lot of those eye shadow pallettes have a bunch of crazy bright colors that are completely unwearable, but every color in this palette looks wearable. great find!